The rich history and tradition of high school graduation ceremonies give students the chance to reflect on the past and look forward to the future. Ayusa wanted to start a new tradition, one that encourages reflection from our students, one that gives a student the chance to address their graduating class with an inspiring speech. Ayusa held a contest for students to submit their commencement speech to the Ayusa Class of 2015. 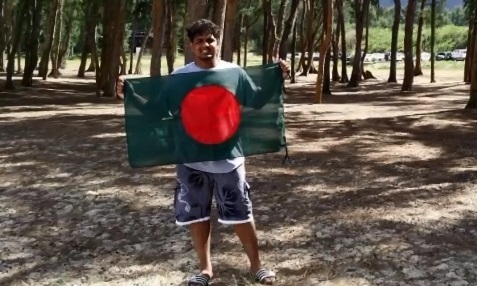 Our winner was an insightful and reflective Ayusa YES student – Targiv from Bangladesh. Below, Targiv shares how Ayusa students become leaders in just 10 months. Congratulations Targiv and the Ayusa Class of 2016! Guess what? We made it; Through all the indecisions and uncertainty; Through the borders dividing countries and mindsets dividing cultures; Through the discouragements and disbelief; We made it; Through the stupid questions and obtuse assumptions; Through sleepless nights and missing home; Through the feeling of being alone to being overwhelmed; We made it; Through gaining weight and making a fool of ourselves; Through the culture shock and social anxiety; Through the currency exchange rates and budget cuts; We made it; Through the mispronounced names and the misunderstood history; Through the shortcomings and drawbacks; Through the good times and the bad; We’ve made it; Through a year that has defined our lives. We are all our own champions. In this year alone, all of us, each and every single one of us have achieved something. We’ve overcome fears, broken barriers and shattered stereotypes. It could’ve been a simple taste of new food but it was nothing less than a triumph. Looking back at the moment we stepped onto that airplane, not knowing the uncertain. But, as I have come to learn among many other things this year, that life is not about knowing. It is about taking a shot in the dark, growing, adapting, learning and finding yourself in places you had never imagined you would. It is indeed about ambiguity. The greatest moments in life are never foreseen, never known or anticipated. If they were, they most definitely would not have been the greatest. It is those moments that come from delicious ambiguity that instill in our minds and hearts to never be forgotten. I’m not one to inspire you people, as I am one of you. But, if I were the voice, I would tell you that the day you stepped into this country, was the first day for the rest of your life. You now embark on a brand new journey. A journey into a greater unknown, the future. But, now you know. Because, you have been through this life in a year. I won't talk about all the things that we'll miss. Because, the things we've gained are far greater to look forward to. How many peple can say, "I've left everything I've ever known and lived in an unknown country amongst unknown people and have made new friends and family, and done all these things." Not many I assure you -- so, be proud. Nobody's perfect but, if you were an exchange student you're pretty close. So, with our heads held high, as global ambassadors let's show the world how leaders are made in just 10 months.